In my previous posts — please be sure to read this post followed by this post and then this post before moving forward since you’ll need some context, and some of the code below is dependent on code in these previous posts — I showed two approaches for rendering a custom attribute — I called this attribute Tag in these posts and will continue to do so here — on a link set in a General Link field which is rendered using the Sitecore ORM Glass.Mapper. In this post, I am going to share an approach on achieving the same but using a custom GlassController coupled with a class that implements the IGlassHtml interface — the code for this class can be found in this post. I declared the above class as abstract since I don’t see how it could live on its own — none of its methods return ViewResult or ActionResult instances. The MainContent method gets an instance of a SampleItemModel from the current Item — in this example these are fields on the home Item — and transforms this into a SampleItemViewModel instance using the protected methods defined on its base class. The SampleItemViewModel instance is then sent to the View. There isn’t much going on in the above Razor View — it’s just displaying data from the ViewModel. I am going to omit how I wired-up the Controller above with a Controller rendering in Sitecore. If you don’t know how to wire-up Controllers with Controller renderings in Sitecore, please watch this video by Martina Welander. Let’s see if this works (works on my machine 😉 ). If you have any questions/comments/thoughts, please leave a comment. 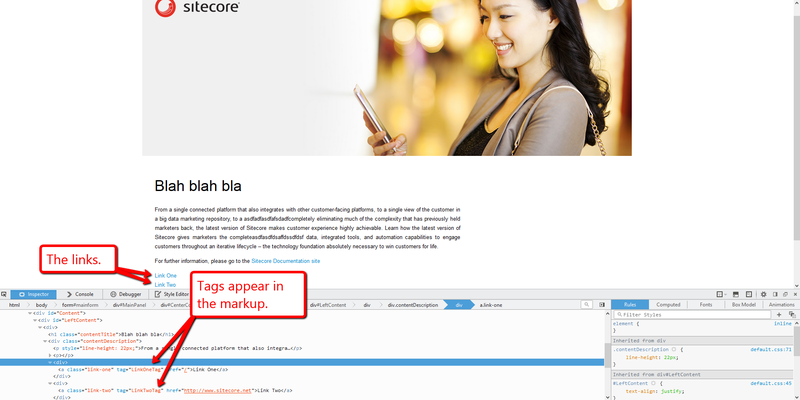 In my previous post, I shared an approach for customizing the Glass.Mapper Sitecore ORM to render a custom attribute on a link defined in a General Link field (I called this attribute Tag and will continue to do so in this post). In this post, I will share a second approach — an approach that extends the “out of the box” Html Helper in Glass. Note: be sure to read this post first followed by my last post before reading the current post — I am omitting code from both of these which is used here. In the above class, I’m using the Decorator Pattern — another Glass.Mapper.Sc.IGlassHtml instance (this is set to an instance of Glass.Mapper.Sc.GlassHtml by default — have a look at the public constructor above) is passed to the class instance and stored in a private property. Every interface-defined method implemented in this class delegates to the inner-IGlassHtml instance. Since I’m only targeting links in this solution, I utilize a CustomAttributesAdder instance — this is a Singleton which I shared in my last post which is defined in the Sitecore configuration file further down in this post — in both RenderLink methods. 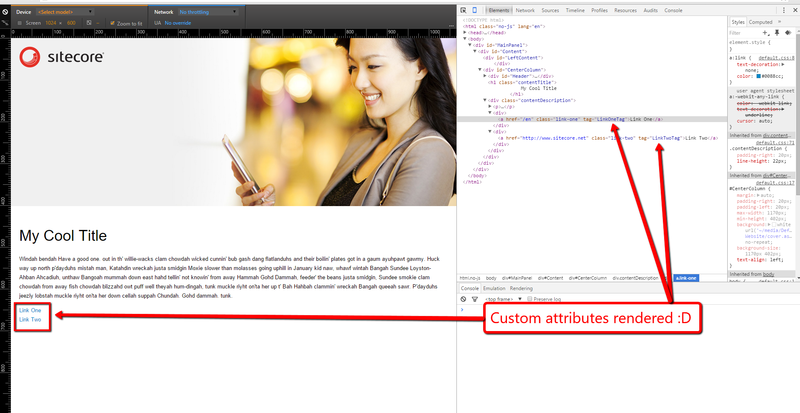 The CustomAttributesAdder instance adds the Tag attribute name and value to the attributes collection when applicable. The modified/unmodified attributes collection is then passed to the RenderLink method with the same signature on the inner Glass.Mapper.Sc.IGlassHtml instance. There isn’t much going on in the the class above exception object instantiation — the above is an example of the Factory method pattern for those who are curious. In the SandboxGlass method above, we instantiate an instance of the IGlassHtmlFactory which is defined in Sitecore configuration (see the patch configuration file below) and use it to create an instance of whatever Glass.Mapper.Sc.IGlassHtml it is tasked to create (in our case here it’s an instance of the SandboxGlassHtml class defined above). This is then passed to a newly created instance of Glass.Mapper.Sc.Web.Mvc.GlassHtmlMvc. If you have any questions/comments/thoughts on this, please share in a comment. 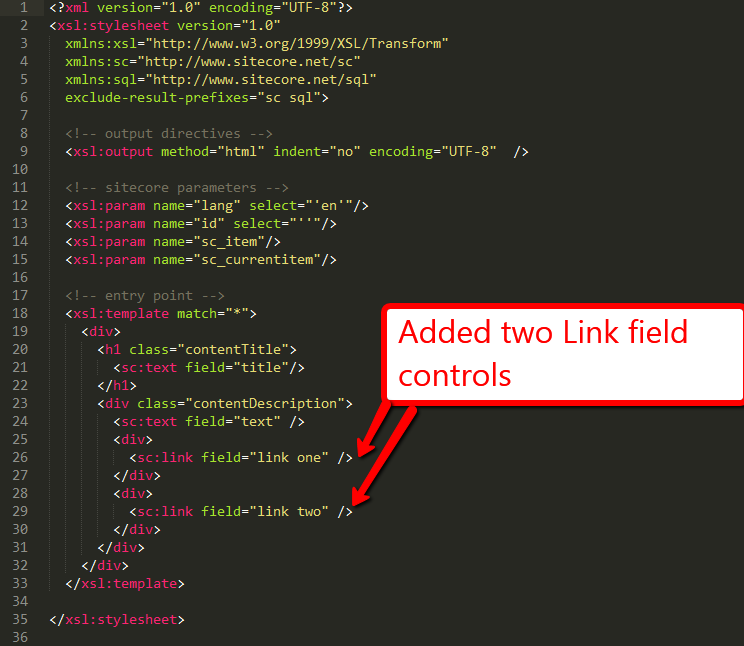 In my previous post, I shared a way to add a custom attribute to the General Link field in Sitecore — in that post I called this attribute “Tag” and will continue to do so here — and also showed how to render it on the front-end using the Sitecore Link field control. You might have been asking yourself when reading that last post “Mike, how would I go about getting this to work in the Sitecore ORM Glass.Mapper?” (well, actually, I planted a seed in that post that I was going to write another post on how to get this to work in Glass.Mapper so you might not have been asking yourself that at all but instead were thinking “Mike, just get on with it!”). 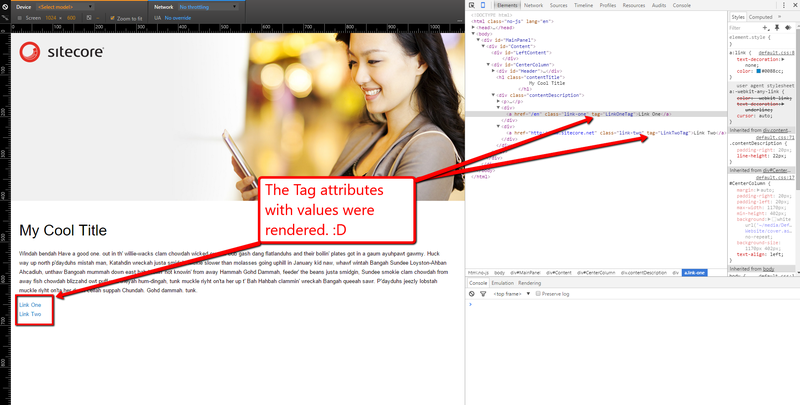 In this post, I am going to show you one approach on how to tweak Glass to render a Tag attribute in the rendered markup of a General Link field (I’m not going reiterate the bits on how to customize the General Link field as I had done in my previous post, so you might want to have a read of that first before reading this post). An instance of this class will magically create a XML representation of itself when saving to the General Link field, and will also parse the attributes that are defined in the XML. There’s nothing much in the above class except for an additional property for the Tag attribute value. Most of the code in the GetField and SetField methods above are taken from the same methods in Glass.Mapper.Sc.DataMappers.SitecoreFieldLinkMapper except for the additional lines for the TagLink. 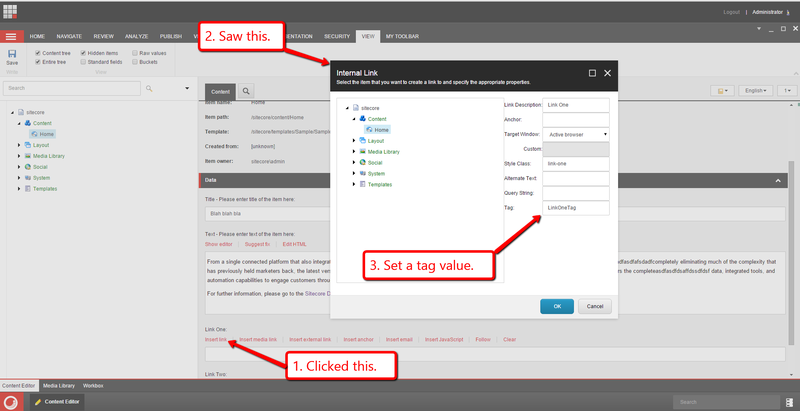 In both methods a TagLinkField instance is created so that we can get the Tag value from the field. * If you are using Attribute Configuration or automapping/on-demand mapping you don't need to do anything! I added the AddDataMappers method to it. This method replaces the “out of the box” SitecoreFieldLinkMapper with a SitecoreFieldTagLinkMapper instance — the “out of the box” SitecoreFieldLinkMapper lives in the 15th place in the index (I determined this using .NET Reflector on one of the Glass.Mapper assemblies). Classes that implement the above interface will take in a Glass Model instance, the field we are rendering, and the existing collection of attributes that are to be rendered by Glass. 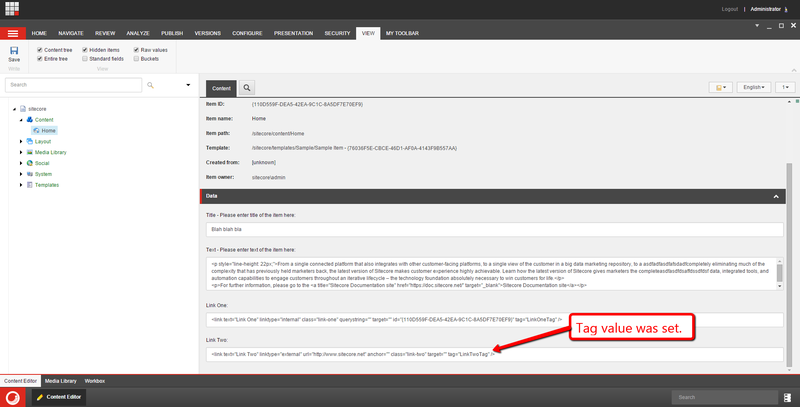 The AddTagAttribute method above first determines if the field passed to it is a TagLink. If it’s not, it just returns the attribute collection unaltered. 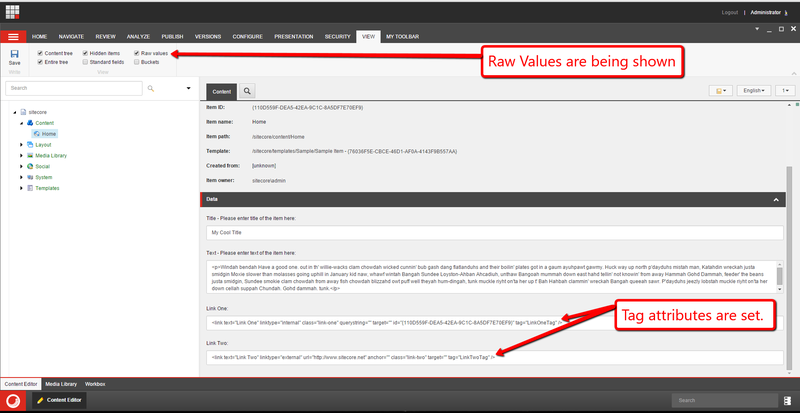 The method also determines if there is a Tag value. If there is no Tag value, it just returns the attribute collection “as is” since we don’t want to render an attribute with an empty value. If the field is a TagLink and there is a Tag value, the method adds the Tag attribute name and value into the attributes collection that was passed to it, and then returns the modified NameValueCollection instance. I decided to use the Singleton Pattern for the above class — the type of the class is defined in Sitecore configuration (see the patch configuration file further down in this post — since I am going to reuse it in my next post where I’ll show another approach on rendering a Tag attribute using Glass.Mapper, and I had built both approaches simultaneously (I decided to break these into separate blog posts since this one by itself will already be quite long). I used the CustomAttributesAdder Singleton instance to add the Tag attribute name and value into the passed attributes collection, and then pass it on to the base class to do its magic. 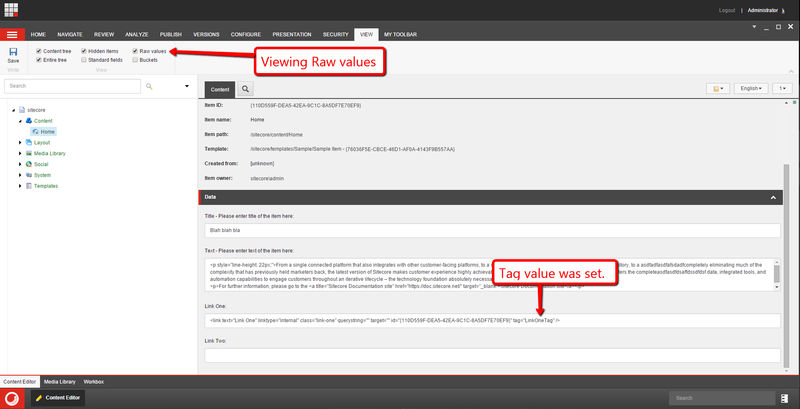 Model instances of the above interface will have two TagLink instances on them. Glass.Mapper will create an instance of the above class which will magically create a concrete instance of a class that implements the ISampleItem interface. The above Razor file inherits from SandboxGlassView so that it can access the RenderLink methods that were defined in the SandboxGlassView class. If you have any questions/comments/thoughts on the above, please share in a comment. 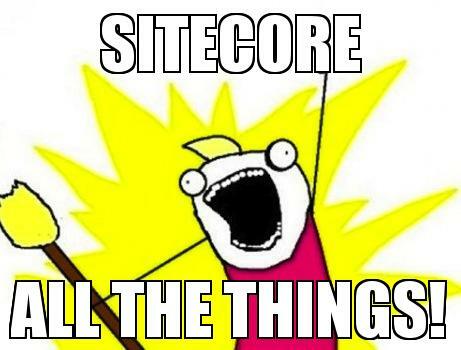 Also, I would like to thank Sitecore MVP Nat Mann for helping me on some of the bits above. Without your help Nat, there would be no solution and no blog post. 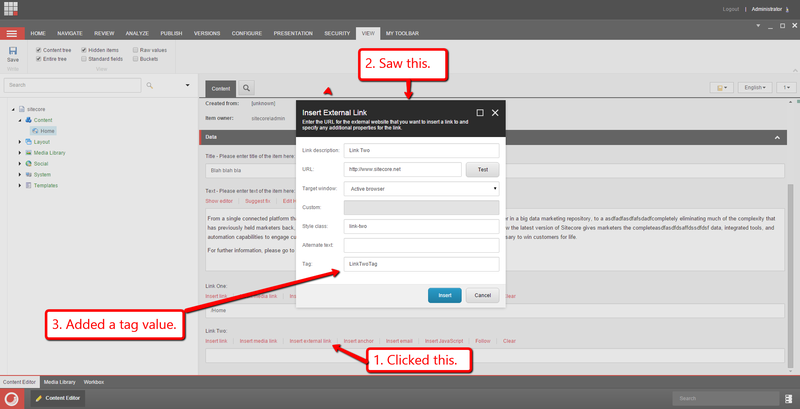 In my current project, I needed to find a way to give content authors the ability to add a custom attribute — let’s call this custom attribute Tag for simplicity– to the “Insert Link” and “Insert External Link” dialogs of the General Link field (NOTE: the following solution does not use the “out of the box” SPEAK dialogs that ship with Sitecore 7.2 and up. This solution uses the older Sheer UI dialogs. Perhaps I will share a solution in the future on how to do the following using the newer SPEAK dialogs). In this post, I am going to share how I went about doing this minus the code I needed to add to get this to work in the Glass.Mapper ORM (I’m going to show you this code in my next blog post). The class above subclasses Sitecore.Data.Fields.Link (this lives in Sitecore.Kernel.dll) — this class represents a link in Sitecore — and added a new Tag property (this class will magically parse or save this value into the field’s underlying XML). The OnLoad method invokes its base class’ OnLoad method — the base class’ OnLoad method loads values from the field’s XML into the Edit controls on the form — and also parses the value from the tag XML attribute and places it into the Tag Edit control. The ParseLink method above is where values from the field’s XML are extracted — these are extracted from the XML attributes of the field. The ParseLink method delegates to the ParseLinkAttributes method which extracts the value from the tag attribute. The OnOK method is where values from the Edit controls are extract and passed to a class instance that generates XML for the field. I could not call the base class’ OnOK method since it would prevent me from saving the custom tag attribute and value, so I “borrowed/stole” code from it, and then added my modifications. Each dialog defined in a pipeline processor of this custom pipeline will specify the dialog’s Url; it’s message — this is how the code ascertains which dialog to load; and any properties of the dialog (e.g. height). 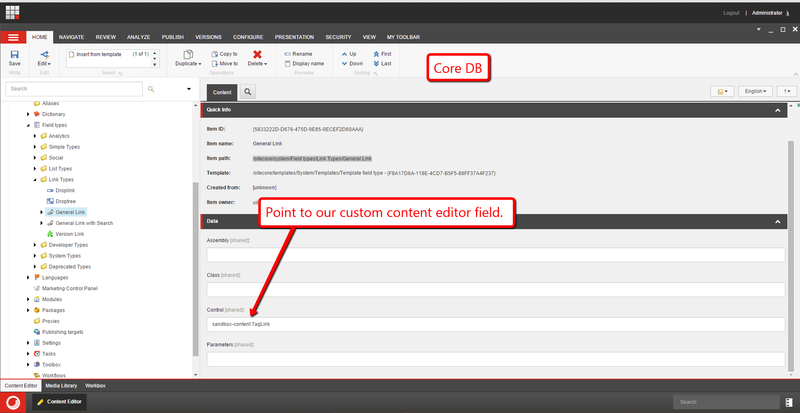 The Sitecore Configuration Factory injects the dialog’s url, message and parameters into the class instance. The CanProcess method determines if there is match with the message that is sent via the DialogInfoArgs instance passed to the processor’s Process method. 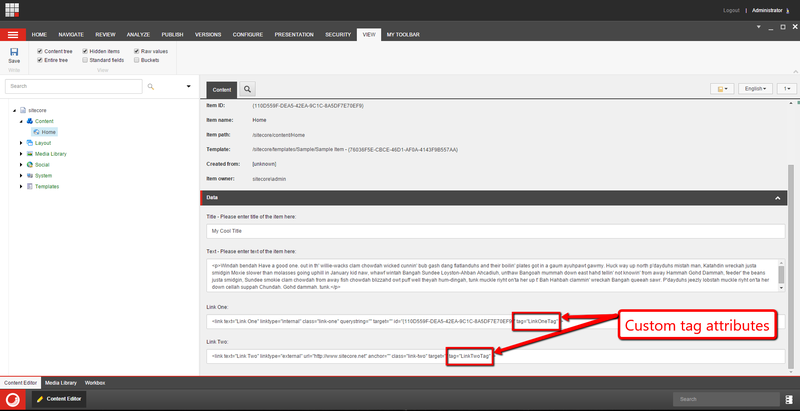 If there is a match, the Url and dialog parameters are set on the DialogInfoArgs instance. If there isn’t a match, the processor just exits and does nothing. The HandleMessage method above passes the message name to the custom <dialogInfo> pipeline and gets back a DialogInfoArgs instance with the dialog’s Url and parameters if there is a match. If there is no match, then the HandleMessage method delegates to its base class’ HandleMessage method (there are dialog Urls and Parameters baked in it). The Process method above delegates to the CanProcess method which determines if the generated HTML by the previous <renderField> pipeline processors should be manipulated — the code should only run it the generated HTML is a link and only when there is a tag attribute set on the field. 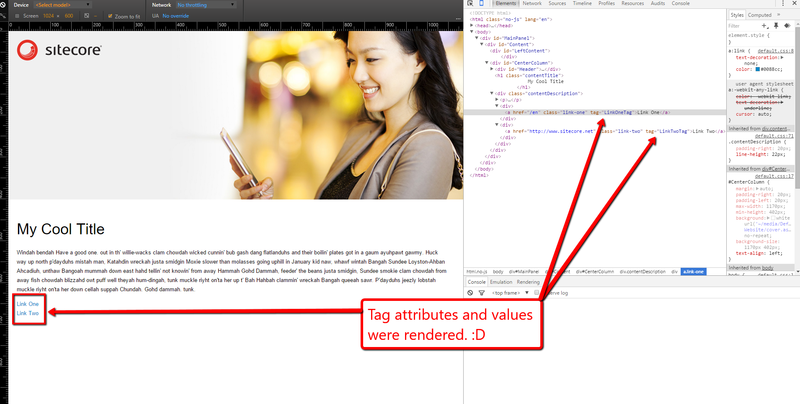 If the HTML should be manipulated, we basically add the tag attribute with its value it to the generated link HTML — this is done in the AddTagAttributeValue method. If you have any comments or thoughts on this, please drop a comment. Until next time, keep on Sitecoring!